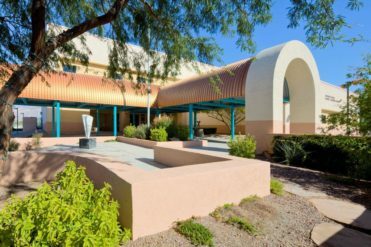 For nearly 70 years, Square & Compass has provided families in Southern Arizona a single facility to care for their children’s most challenging of health needs. It gives me great pride when I consider that Square & Compass’s original vision— caring for medically challenged children—has not changed in all those years, even as we’ve expanded our facility for the benefit of Tucson’s children and pediatric community. 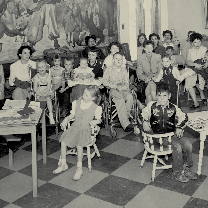 That vision began with 500 square feet and one clear need: to provide rehabilitation for children with polio. Over the years, whenever Square & Compass was able to expand to meet current needs, we did so. We’re now able to provide great space for pediatric experts in more than 25 disciplines in one state-of-the-art facility, and we’ve lessened the burden on families struggling with unique healthcare problems. Square & Compass owns and manages ongoing enhancements of the building that houses Children’s Clinics. 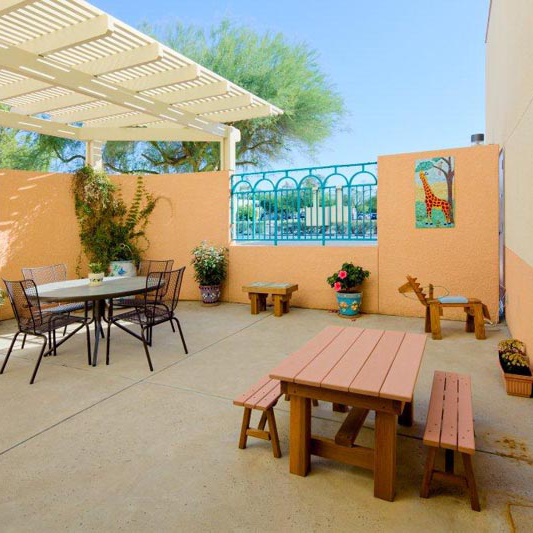 This allows Southern Arizona’s pediatric doctors, nurses, therapists and other specialists to care for our children in a warm and inviting environment. We also assist with the cost of care for uninsured and underinsured children and teens. We also make the facility available for the Los Angeles Shriners Hospital for Children’s Outreach Clinic two to three times a year to serve children in Southern Arizona and Northern Mexico who have had surgery performed at the Shriner’s Hospital in Los Angeles. We welcome the Los Angeles physicians to Tucson for follow up visits with their young patients who live in our region. We’re proud of our role in these honorable endeavors, and we’re humbled daily by donor contributions that allow us to fulfill this critical community mission. For nearly 70 years, Square & Compass has provided families in Southern Arizona a single facility to care for their children’s most challenging health needs. Square & Compass owns and manages ongoing enhancements of the building that houses Children’s Clinics. This allows pediatric doctors, nurses, therapists and other specialists to care for our children in a warm and inviting environment. Ted and Daisy Walker’s vision for serving children with special health needs began, appropriately enough, in a backyard playhouse. Local carpenters, electricians, ad brick layers agreed to dedicate their time and build a more permanent building in 1949. The 50,000 sq. ft. facility, known as the Square & Compass Building is located on the campus of TMC and is still provided by Square & Compass in a partnership with the Children’s Clinics. It was 1947, and polio was at its epidemic peak in America. For children with the disease in Southern Arizona, the closest rehabilitation center was in Phoenix, but the Walkers realized that transporting such vulnerable children all the way to that facility had become unsustainable. “It would do more damage than good,” Ted would later recall. 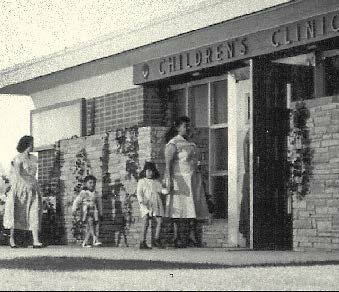 Frustrated, they were prepared to do whatever it took to establish a permanent children’s rehabilitation center in Tucson. As it turned out, “whatever it took” included offering up their daughter’s new backyard playhouse. They coordinated with state health and welfare officials, and with the help of volunteers, the 36-foot long structure became Southern Arizona’s first sanctioned polio rehabilitation center in a matter of days. The facility opened four days after state approval. Soon after, its one dedicated doctor and two physical therapists were treating more than 100 young polio patients a week. While it wasn’t yet called Square & Compass, the foundation for expansion was already in place. And as the polio epidemic continued to grow unabated, the Walkers knew exactly who to turn to for that expansion: The Shriners. As the doors to the first polio rehabilitation facility for children in Southern Arizona opened, Ted knew it was time to make it more permanent. Soliciting the help of fellow Freemasons, a plan was put into place to provide a permanent facility as soon as possible. The state of Arizona agreed to lease the land for 25 years at $1 a year, and local carpenters, electricians and brick layers agreed to dedicate their time and expedite their work. As a result, a new 12,000-square-foot facility was dedicated in December of 1949, just four months after ground was broken. Arizona’s Freemasons made the difference. 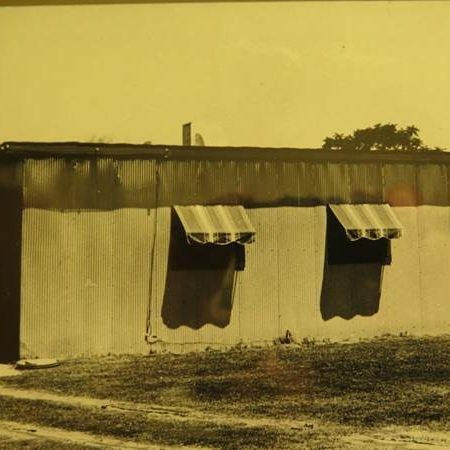 They agreed to continue offering a quality medical facility for pediatric specialists, and when that first facility opened in January of 1950, its name reflected the two architectural tools that best represent the masons: Square & Compass Crippled Children’s Clinic. By 1991, when we opened the doors to our current facility, Square & Compass had more than answered Ted Walker’s call for dedication to children. The 50,000 square-foot facility, known as the Square & Compass Building, is located on the campus of Tucson Medical Center and includes 65 specialty and primary care providers in 28 pediatric disciplines, 22 rehabilitation staff, nine nurses, and five social workers—all dedicated to serving children with unique healthcare needs. At that same time, we partnered with Children’s Clinics, the operational arm of all pediatric care that takes place in our facility. Patients receive all their care under one roof, from laboratory and radiology testing to physical and occupational therapies. In an effort to be good stewards of our resources, we have been mindful about the sustainability and efficiency of our building. In addition to recent renovations, we’ve also included solar power and substantial HVAC improvements. Square & Compass is proud of our partnership with the dedicated medical professionals at Children’s Clinics. We remain very much involved in delivering comprehensive, multi-disciplinary medical care for children in Southern Arizona with complex medical conditions, and support Children’s Clinics as they endeavor to deliver those services. Although Square & Compass doesn’t provide the medical care, we’re grateful to be able to support the Children’s Clinics’ pediatric specialists who do. 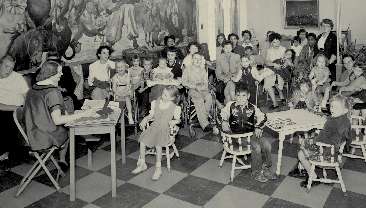 Our vision, born out of necessity, remains the same as Ted Walker’s was in 1947: to facilitate the care of children. Square and Compass remains committed to that ideal.